The different welding parameters influencing the steel weld ability complexity determination study, brings us to assimilate this assembly process to a black box which have several inputs such as: the welding energy (temperature) , the assemblies geometry, the filing metal and the work environment , and as for output, materials weld ability aptitude. Our work consists in establishing an identification temperature effect methodology on the heat affected zone (H.A.Z.) apparition, proceeding by a local heat treatment and using characterisations means : metallography, mechanical (micro hardness) and non destructive testing (ultrasonic technique). The importance that assigns the industry to assemblies, holds these different assemblies types the convenient possibilities and advantages economic fact. However, the soldering realisation permit to get some mechanical properties can resist the applied solicitations to the welded sides, depends, strongly, on a metallurgic study. This study puts in evidence the thermal treatment structural and constitutional transformations exits associated to the operation of weldering. The goal of this work consists in identifying zones transformed by a prompt source that constitutes the simplest welding thermal cycle simulation . This specific thermal treatment is considered like a following successive thermal treatments adjoining the treated locally zone. This approach misleads a structure gradient characterised by a micro hardness gradient creation. The mechanical holding structures welded assessment by tests no destructive and the rupture mechanics in the HAZ presents a considerable interest nowadays. Well that progresses have been accomplished in welding and physical metallurgy, scientific research various ways are again in development on the thermal simulation phenomena and the microstructures forecasting so the HAZ tenacity . In order to be able to deduct all logical morphological transformation according to the local thermal treatment, the reference to samples stallions is indispensable. In our objective, these stallions must have thick grains and all internal constraint detentioned . Because of the relations between numerous variable ignorance (qualitative and quantitative) composing the soldering, the welding sequence complexity obliges us to orient our research on the welding cycle thermal simulation by a local treatment on the type Z30C13 rustproof steel. The thermal source metallurgic effects on a steel are assimilated to the welding operation cycle. This study rests on two essential parameters that are the temperature reach and its maintenance length. Being given the influential factors number intervening in the physic-chemical transformations process, the induced morphological variation interpretation is not simple. Following a samples homogenisation , the every point thermal history knowledge is got thanks to thermocouples implanted at different distances and different depths away from the source impact point. The chosen steel is the Z30C13 type greatly allied belonging to the rustproof martensitic family considering contents in carbon and chromium. This steel, whose utilisation concerns the thermal power station overheater tubes present weldability problems in the strong thickness case. The chromium encourages the phase «a » and widens the existence domain. With a superior chromium percentage to 13%, the alloy undergoes only little or not transformation and remain in phase «a » while holding carbon, nitrogen and nickel rates amount, and knowing, in particular, that these elements widen the phase«c » austenitic existence domain . The pseudo-binary Fe-C diagram (Fig1) is a cut to constant chromium (13%) ternary Fe-Cr-C gives the different phases and carbides constituting steel to the balance diagram state. Curves Fe-Cr-C isotherms (Fig2 a and b) give cuts to 20°C and 700°C and facilitate the phases identification and the existing carbides. The TTT(time temperature transformation ) curves and CCT(continuous cooling transformation)  give a more precise idea on transformations dynamics during the cooling. Besides, three Z30C13 conventional HT(heat treatment) types are given by the documentation: hardening, tempering and annealing treatments [1,2]. On the six half-cylindrical samples, three have been used for the thermocouples implantation . Other samples cut up on the same log served to reference tests, analyses and to the preliminary study for the most suitable treatment choice. Steel no treaty gives a martensitic structure (Fig3-a) to acicular structure corresponding probably to a austenitisation follow-up a steeping. Micro-hardness Tests give 296 HV mean . The big disparity between micro-hardness achieved values (Vmax=335 ,Vmin=267 HV) can be explained by the splitting of the martensite at the cooling time as suggested by the documentation , which consider as a carbides precipitation before the Ms point reach or as a carbon atoms grouping in the privileged zones. The thermal treatment choice is an austenitisation at 1200°C, a maintenance of 3h30mm with a cooling to the oven. 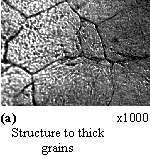 The micrograph (fig.3) gives a structure to thick grains corresponding to an homogeneous matrix and less acicular with regard to the basis martensitic material . There is place to note that the maintenance permits a growth and even a grains coalescence . Micro-hardness tests give the 703 Hv average value on the grain. These elevated micro-hardness value is bound to a shearing phenomenon in the matrix stimulated by an interns constraints concentration and a carbides formation type ((Fe-Cr)23C6) dispersed in the matrix. The tempering treatment at 600°C during 2 hours with a cooling to the oven, justify the constraint concentration reduction corresponding to a 334 Hv micro-hardness grain average value. Nevertheless, the got homogenisation, even though it remains partial, constitute a reference that could permit the induced transformations registration at the local thermal treatments. The local and prompt thermal treatment bases itself in the act that the heat source section is very small in the one treated face front correspondent to the two half-cylinder union basis. a half-cylinder no treated (no homogenised), on which are implanted thermocouples. The applied heat source for the treatment is produced by the bow welding process (micro -plasma). The applied cycle consists on a heating until the zone fusion where the source is applied ,with a fusion 3 mn maintenance and a 20mn cooling to air period. The twelve implanted thermocouples, to the identical depths and different distances, are joined to an tension indicating equipped electronic system displaying every three seconds tension delivered by thermocouples one after the other. The maximal temperatures don't pass 800°C as shown by curves of the figure (Fig.5) that represent the thermal cycle measured by four of the implanted thermocouples. These curves show, also, an important heating speed with regard to the cooling one without a considerable maintenance length to temperature reaches. The structures observation to the microscope begotten by the heat source effect is given by figures 6,7 and 8. The grain size , to acicular structure, decreases while moving away the source impact to be only a basis metal structure in the half-cylindrical no homogenised case. In the homogenised half-cylinder case, the smaller grains than those of the basis metal, are refined to a substantial manner. Micro hardness in the samples transverse and longitudinal senses are given by the figure 9. The local thermal treatment effect creates a structure gradient confirmed by a micro hardness gradient. Transformed zone measurements and temperatures reaches values constituted a handicap in an interrelationship temperature - structural topography research . For it, another test of local thermal treatment has been considered. a better eight thermocouples distribution to surround the best thermally affected zone:HAZ. With a blowtorch oxyacetylenic, the fusion temperature has been reached and has been maintained during 9mn, follow-up by a cooling to air. Curves (Fig10) give four thermocouples implanted temperatures measurement. The microscope observation (Fig11) gives the different zones transformation. The zones transformed widening is more important than the first test , which can be explained by the more important maintenance length fusion temperature. The third under zone shows a slightly modified structure with regard to the initial structure, which is owed to transformation beginning temperatures (750°C and 850°C). The corresponding micro hardness measures are represented by the figure12 curves. to note the structural gradient within the zone transformed, described by the three zones, which is appreciable to the source energy used and in the maintenance length fusion temperature. Fig 12: Micro hardness HV measures no homogenised sample, homogenised sample.a)In the same way to the half-cylinder main axis.b)Perpendicularly to the half-cylinder axis to: 0.05 (1) , 0.55 (2) , 3.80 mm (3) of the treated face. In a no destructive zone transformed characterisation tentative goal ,the ultrasonic measures has been done, in immersion to the normal and oblique impacts, and concern longitudinal and transverse waves velocities. Measures have been achieved with a 2Mhz ultrasonic focalised probe . The curves got (Fig.13) are not revealing the transformed zones minute extent . 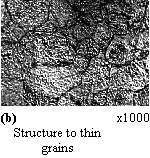 Metallographic Analysis permitted us to determine the different grains morphologies owed to the thermal effect and to value the affected thermally zone extent degree and fragility zones by micro hardness curves. Nevertheless the got results oblige us to foresee other steels for a deepened analysis, in particular more according to the equivalent carbon and the weldability in general. TESTARD: Rev. Weldering and Related Techniques. (July / August 1994). J. DEFOUNI: Rev. Weldering and Related Techniques. (July / August 1994). D. SEFERIAN: Metallurgy of the Soldering - 1965. L. DEVILLERS, D. KAPLAN, J. P. JANSEN,: Rev. Weldering and Related Techniques (mars/April 1987).